Do you need to hide away the annoying Seen and Typing indicator on Facebook chat? I assume your answer would be a yes. Continue reading to find out how you can disable the last seen and typing indicators on Facebook. Facebook has been rolling out numerous layout changes and updates at regular intervals to make the social network more user friendly and interesting. In spite of all these there’s one tiny annoyance on Facebook that’s bugging the hell out of Facebook users and unfortunately it can’t be disabled or turned off. The annoyance I am referring to is the Seen and typing indicator on Facebook. Usually when you are chatting with another person of Facebook, the other person chatting with you knows if you have seen his last message or not. In case you want to avoid chatting with a person, the last seen and typing indicators can give away the fact that you are connected with him on the chat but avoiding him. As I said before, Facebook doesn’t allow you to disable the seen or typing indicator but with the help of third party extensions for Google chrome, you can easily hide the last seen and typing indicator on Facebook. 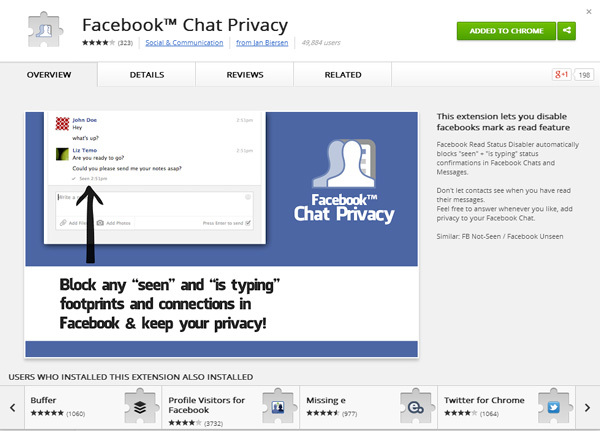 Facebook Chat Privacy is a free extension for Google chrome, which once installed will automatically hide the seen and typing indicator on Facebook. Simply install it on Google chrome and let the extension do the rest for you. Unlike other extensions, Facebook Chat Privacy wont show up as a icon on Chrome’s extension bar, instead it will only appear inside chrome’s URL bar whenever you are on a Facebook domain. I have tested the extension on Google chrome and it perfectly does what it claims. The extension was successful at hiding the seen and typing indicator for me, whereas I was able to see whether my fiend has seen my last message or not. Apart from Facebook Chat Privacy there are a few other recommendable extensions such as Facebook unseen and FB unseen that can be used for hiding the seen and typing indicator on Facebook.